The beloved spiritual teacher builds on the message of his enduring New York Times and international bestseller The Four Agreements with this profound guide that takes us deeper into the tradition of Toltec wisdom, helping us find and use the hidden power within us to achieve our fullest lives. How do I express love? At each stage in our lives, we must ask these simple yet deeply profound questions. Finding the answers will open the door to the next stage in our development, and eventually lead us to our complete, truest selves. But as Don Miguel Ruiz makes clear, we suffer if we do not ask these questions—or if we fail to pay attention to their answers—because we either never act on our power or use it destructively. Only when power is anchored in our identity and in reality will it be able to be in synch with the universe—and be of true benefit to ourselves and to others. 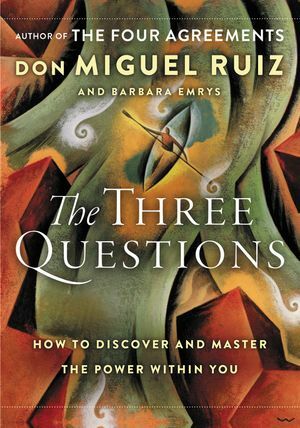 The three questions provide a practical framework that allows readers to engage with Ruiz’s transformative message and act as a vehicle for overcoming fear and anxiety and discovering peace of mind. An essential guide for all travelers pursuing self-knowledge, understanding, and acceptance, The Three Questions is the next step in our unique spiritual metamorphosis.